When futures opened for trading at 6:00 p.m. ET on Wednesday, the eMini S&P 500 futures fell as low as 1.8 percent in a sudden move on above average volume. Speculation for the swell in volume and plunge in futures included the news of the arrest of the CFO of the Chinese telecom company Huawei. The arrest was made by the Canadian authorities on the extradition request by the U.S., a move that some worried could put trade negotiations between Beijing and Washington at risk. 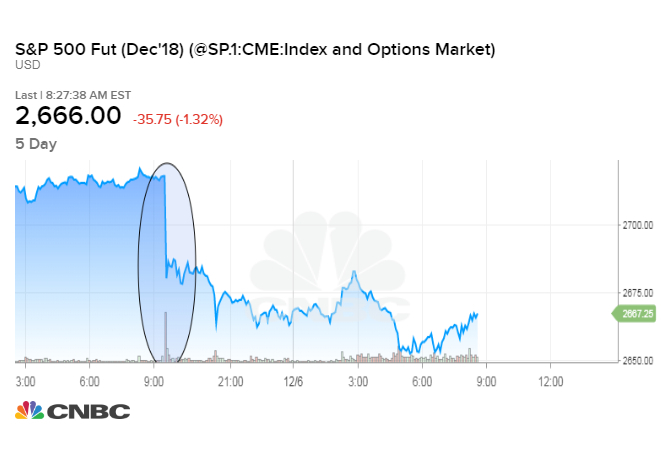 “After we saw this Huawei news hit, it seemingly (and inordinately) contributed to an almost impossible 65 handle drop in Spooz (S&P futures) on the overnight reopen, with 36,700 contracts trading in the first 10 minutes,” said a note from the Nomura Securities trading desk. But traders also speculated that the selling could be attributed to a large fund or funds liquidating a position. Futures briefly recovered but then eventually fell back to near those lows as traders said the damage was already done. “After the gap lower inevitably hit more US Equities ‘stop loss’ limit orders and further bludgeoned trader sentiment, the modest recovery thereafter lost further steam over the very early US hours,” stated the Nomura note. The CME’s Velocity Logic is designed to detect market movements of a set numbers of ticks up or down in a predetermined amount of time and halt trading if necessary. The S&P 500 fell 1.7 at the opening bell Thursday while the Dow dropped more than 450 points, bringing the index’s two-day losses to more than 1,000 points. The moves may also be linked to pent-up market jitters that accumulated when the major exchanges were closed on Wednesday for the funeral of President George H. W. Bush. — With reporting by CNBC’s Michael Bloom.